Do you want it? Do you want it now? Normally when I set up scenes I find a really good sim to photograph myself in or a backdrop (possibly even try to attempt to decorate something myself if I’m inspired enough) but this time I decided to go very bare bones and with some choice lighting I decided to give shadows and the dark a try to convey the visual that I’m looking to portray. The Men Jail opens its cell doors up tomorrow for the new round and while I was looking through all the fun assortment of items I came across something I normally do not see at events or even most of the stores that I frequent. RL Fashion released a mesh razor that fits in your mouth so it looks like you are holding it between your lips and teeth. I feel that it reminds me a little bit of one of the scenes in The Dark Knight where The Joker is telling Rachel Dawes a version of the story about how he got his scars and goes on to say that he stuck a razor in his mouth which is what caused them. With that in mind I kind of created my own scene in my head with someone that isn’t all right in the brain space with a razor in his mouth but let me preface this and say that cutting is not a healthy choice but some feel that it is necessary to deal with some of the things that life throws their way. I wish for no one to harm themselves and if there is a way to seek guidance and help for situations like this, please talk to someone. The razor prop while it is unique I feel has one small fatal flaw, it is rigged and cannot be resized or adjusted which might be a problem for some users. 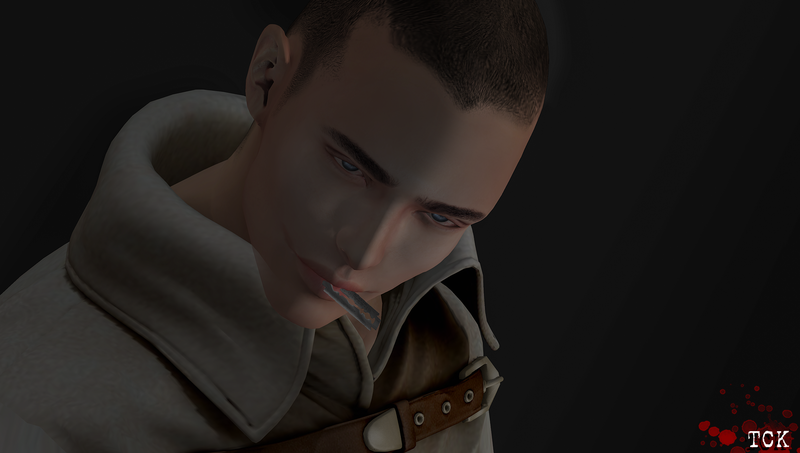 It seemed to work well with my Vista Animations “Gerard” head with the right facial animation but I cannot vouch for anyone other mesh head products. This blog post is likely one of the most simple ones I’ve done in probably any of the ones I have done (and I’ve likely said that before but this truly is trying to be creative in the most minimalist way possible. Having a great background behind you is a lot of fun but doing things you may not have tried before or have been too afraid to (such as not keeping the background free to help set the mood of the photo). For my outfit I am using an item that had once been featured at The Men Jail but was before I was chosen as an official blogger. The owner of the Joker’s Asylum store is someone I talk to from time to time and I feel like we are friends considering our passion for certain fictional characters which is a great friendship building tool. The “Straight Jacket Outfit” is something I consider just as unique as the mouth razor and something you might not generally see in a lot of places. It’s not your traditional straight jacket or asylum patient’s attire. It really has a style to it which coincides with some of the things I like (I’m not always straight formal wear or urban wear; I like to mix it up.) I knew the right time for this would come in handy much like a lot of the things I purchase at events and don’t blog right away, they have their time and place…this would be it. Since I said I would be keeping this brief I feel that wrapping things up for this post will be a good idea. There’s plenty of things that I’d like to get into especially some of my TMD items as well as the great new Cold-Ash boots from the event as well. 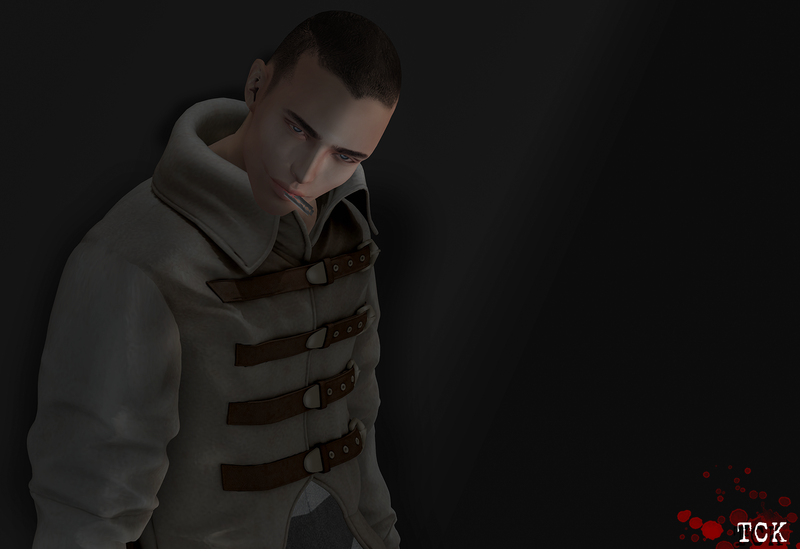 There are also new styles from Modulus for me to work with as well as some other fun stuff. Also I in future posts I may be using items from the Men’s Only Hunt that started up on the 1st of the month. It’s always fun going hunting for some really cool prizes and from some of the ads I have seen for things that are part of the hunt…I need to get a jump on that before I find myself out of time to grab them. I should be back to my norm and out on location for my next work or using a backdrop but it was nice trying to do something different and maybe it will give me more inspiration to do it again in the future or it will be a lesson not be as adventurous…we shall see.